As pet owners, we dread the day we will need to say goodbye to our furry friends. Sometimes it is sudden and other times, we have time to prepare. This is my story of a ten-month journey and the fight to give Tucker life. It was never about saving his life and finding a cure but simply, giving him more life. From beginning to end, as life twisted and turned, I often felt completely ill-equipped to handle what was in front of me. My hope is by sharing Tucker’s story, others can learn, find peace and understand most journeys can’t be predicted or planned, but they are always worth taking. June 23, 2015, I wanted to celebrate Tucker’s 7th birthday. Instead, Tucker and I were making a trip to the vets to figure out what was going on with a persistent limp he had been experiencing over the last few weeks. Shortly after they took Tucker from me to conduct an x-ray, the vet entered the exam room and asked me to come look at the x-ray. My heart sank into my stomach as I knew the news would not be good. It took all of a nano second to see the tumor. Osteosarcoma. Terminal. This would be my burden in the coming months. To reach inside me and Tucker to connect in a way that would help guide us through the journey that we both now faced. There was no cure but there was hope. Hope that Tucker could become pain-free for some time. Hope that Tucker would be the one who would beat the odds. Hope that we both could be brave enough to fight the battle we were about to face. 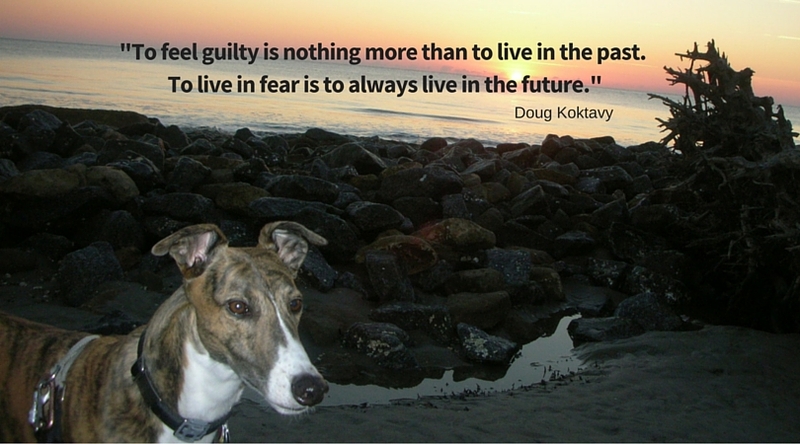 He goes on to explain that two main emotions, guilt & fear, keep us from living in the present. He explains that “to feel guilty is nothing more than to live in the past. To live in fear is to always live in the future.” I found such a sense of peace and relief in this wisdom remembering how much time I spent searching the internet trying to find a cure, a sliver of hope, a promise that Tucker wouldn’t leave me. Then there were the days I became obsessed with wondering how he was going to die. How would I know? How would I ever be able to make the decision? All the time Tucker would be by my side, chasing squirrels, starting the neighborhood dog chorus, cheering on passing motorcycles or sniffing the evening air. Clearly, Tucker was not concerned. He held no ill will for me or my decisions and could not have cared less about what tomorrow would bring. I wish I could have seen that then. So my lesson to you is this. Have faith & hope not guilt & fear. Not every day needs to be special as sometimes the special things are simply the stillness, comfort, and solitude of the moment. In the final weeks of Tucker’s life, I finally began to realize the importance of the moment. I would sit next to him in the yard and just watch his movements. I would try to see what he was seeing, smell what he was smelling and hear the far off sounds that made his ears go wonky. Through this, I felt more deeply connected to him and the world around me. This would be one of Tucker’s final gifts to me. For this, I am thankful. ← Do You Travel with Your Pets?